I think there is a lot of room for visual improvements of the group-headers especially in the combination with the details-mode. However this is something that needs to be discussed with our Oxygen-gurus Nuno and Hugo and will hopefully be improved in the next version. Still I'm quite happy with the new implementation. It fixes performance issues that occured with the previous implementation, fixes keyboard-navigation issues and provides a solid base for future extensions like grouping by rating, tags, comments or any arbitrary grouping-category. The rewrite of the Dolphin view-engine was a lot of work and resulted in changing of much code. The benefits are an improved performance, getting rid of a lot of bugs that could not be solved with the old view-engine and a better maintainable code-base. But it would be illusionary to expect that there will be only benefits and zero regressions: Dolphin 2.0 will be a typical "dot zero" release where minor issues will popup after the release. However based on the current feedback on bugs.kde.org there seem to be no showstopper bugs left. The currently known regressions and missing Dolphin 1.x features can be seen on the Dolphin 2.0 Status page and I'm confident that during the 4.8.x release cycle most regressions can be fixed. Now in Dolphin 2.1 it will be possible to show all this kind of meta-data as part of a file or directory in all view-modes (this also includes sorting and grouping). The view-engine internally already supports this but I could not finalize the user interface for the 2.0 version. This makes it e.g. possible to configure a kind of "Music view" where for each song the artist, album-name and the rating is shown. Another usecase might be images, where showing the image-width and -height as part of each image might be useful. Thanks Peter! Dolphin is awesome! Thank you a lot Peter. You make KDE rock. Just please make sure that icons rearrange animations (was shown in previous blog post) are configurable (on/off), and off by default. I take it that the "columns view" is being abandoned? Is there a definitive reason for this? 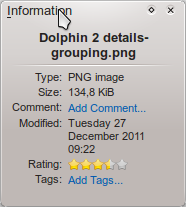 Long ago, Konqueror's detail view could display the "comment" property embedded in a JPEG file's metadata (which is not the same as the "comment" property displayed in Dolphin 1.6's property dialog). I hope you can restore that functionality. 1. A special interface for Nepomuk searching (just like you mentioned special interfaces for music, videos, and the like). We are clamoring for it. 2. A special interface for timeline:/ , along with a Timeline button. If that feature is more accessible, you'd won 1 million of internets. 3. A special interface for System Settings. If you can drop the "System Settings" app and replace it by a Dolphin special interface, it would be beyond awesome. 4. 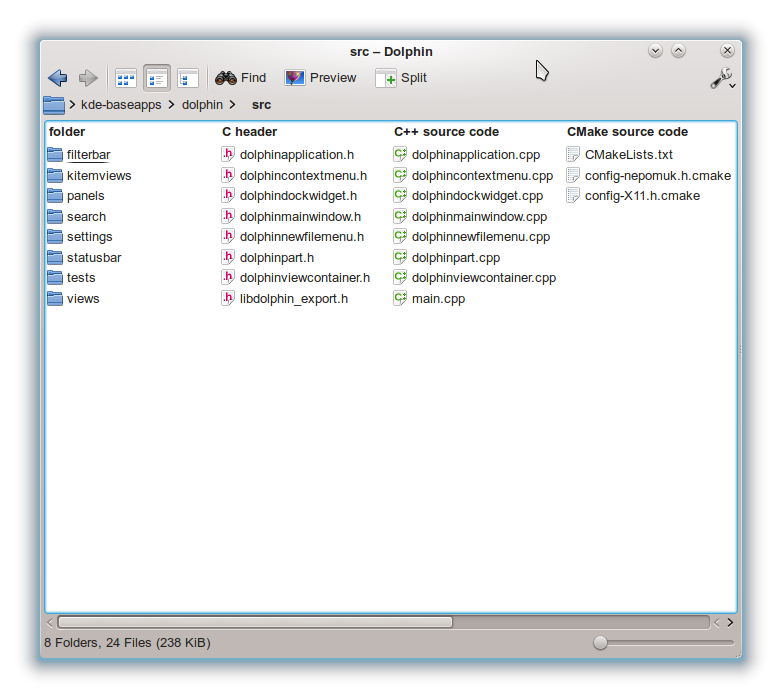 Even if it already is in KDE 4.9 release plan, ensure that every file/open dialog uses the new Dolphin engine. Great job, changes look great, and those future improvements seem very interesting too. From what I've seen in 4.8 betas and RC1, Dolphin2 works great. Thank you very mush for your hard work. Dolphin is much faster now ! @all: Thanks for your nice feedback. Regarding wishes and bug-reports: I'd kindly ask to use bugs.kde.org for this, it is impossible for the Dolphin team to keep track of wishes and bugs mentioned somewhere in the blog. Also you never will get informed about any updates of the wishes and bugs when posting them in the blog - on bugs.kde.org you'll get informed automatically about any state-change and discussion. > are configurable (on/off), and off by default. I did not show any animations in my previous blog post on purpose. I guess the animations you are referring to are the Dolphin 2.0 YouTube videos? They show an outdated alpha state of the animations and don't represent what will be available when releasing Dolphin 2.0. You are right: The column view is not available anymore and also won't be available in later Dolphin releases. The decision to drop the column view was not easy. I myself liked the column view a lot and used it e.g. for browsing my music collection. However the column view has obviously been used by only very few people but was tricky and timeconsuming to maintain. For a project like Dolphin it is important that patches also can be written by non-core developers, but the column view introduced an internal code complexity that raised the "entry-barrier" for contributors unnecessary (and also made it tricky for us core-developers). In fact there is no big Dolphin team that can take care about maintaining something timeconsuming that is used by only a ratter small group (and I count myself as part of this group). So it was a hard decision but in the end we went for having a maintainable code-base to be able to do the things we offer really right instead of offering things that we are not able to maintain. Thanks a lot Peter ! What you achieved is really great and most appreciated by the community ! You are right: The column view is not available anymore and also won't be available in later Dolphin releases. I still use konqueror am using the column view 99% of the time. Since konqueror use dolphin for file view that means no more column view in KDE. Dolphin als a simple file browser was a neat idea, but since konqueror was abandoned and no one has done anything for the not simplest cases, dolphin is all we've got. So I guess, I have to stay at 4.7 for ever or lock somewere else for a DE where I can actually work. Nooooo, not the column view :( I'm using it and love it. Sorting in grouped view - sorting appears to be folder, then type CAPITALIZED (CVS, HTML, JPEG), then type lower case (backup file, plain text, unknown). Would it be possible to not take into affect capitalized when sorting? @Peter: Even while the columnview is (according to you) used by such small amount of people...it is still brave you removed it so Dolphin will be more stable in the future. It's rare developers remove functionality for the greater good over their own habbits. Respect! @Anonymous (both): I think peter explained very well. If you are attached to the columnview you should arrange a group of developers that can and will maintain it. Please let Peter make 100% stable software for 99% of the users instead of 99% stable software for 100%. - If the computer is too slow for animations or if a user hates animations in general then just reduce the graphics effect level in the system settings. Dolphin respects this setting and turns off animations when using a small graphics effect level. - If the computer is fast enough for animations but a user only doesn't like one specific animation in Dolphin then please submit a report with concrete suggestions at bugs.kde.org so that the animation can be fixed/improved. Providing a Dolphin specific option to turn off animations is just a poor workaround in my opinion to prevent going the hard way and making the animations fast and unobtrusive. "I think peter explained very well. If you are attached to the columnview you should arrange a group of developers that can and will maintain it. Please let Peter make 100% stable software for 99% of the users instead of 99% stable software for 100%." This post discussion has convinced me that I need to have a proper ID tag so that I am not mixed with other anonymous, so for clarity sake, I am the one that first asked about the "column view". Now on to the discussion. BartOtten, I agree that Peter explained it very well - and Peter, thank you for responding. While I am sorry to see the "column view" go, I know that there are several things about Dolphin that make it wonderful. I appreciate your work, and support you in the way that I best can. Bartotten, if I can supply some advice without you taking offense, I would caution against telling people that if they don't like it, they can simply program it themselves. It is at best condescending, and at worst akin to "Let them eat cake". I understand that there are people that will flame, especially when features are taken away, but this will only anger people. As I said, no offense meant. Dolphin is getting better each day. Vielen dank, Peter. I only miss the horizontal split view present in Konqueror, this way I can see all my info columns when splitting the view. It's a pity we can't do the same in Dolphin. > pity we can't do the same in Dolphin. This is on my TODO-list since a long time already but I postponed it from release to release :-( This wish is tracked on https://bugs.kde.org/show_bug.cgi?id=168592 since 2008 but to my surprise there are "only" 2 duplicates and 5 people voting for this. Personally I think it would be useful to have this option - probably with Dolphin 2.1 where we can have additional columns in the details-view having the ability to do a horizontal split would be useful. Nice work, Peter. The new group mode in columns looks very promising! I was going to post a quick "great news, congratulations and thanks" message, but after reading the comments, my thought is very different. Please, don't read the following as a criticism. Is just a question that I'm asking myself, and hopefully somebody else can know the answer. How comes that it seems that KDE loses features over time, instead of winning them? With Konqueror 3.5 you could have all or almost all the features that people ask for here (I don't know about the columns one, since I don't use it, but certainly you had much more views than you have now). Is there something in Qt 4 that makes creating a file manager much more difficult than with Qt 3? Thank you for the work. Dolphin 2.0 looks fantastic. Just one request. Can you ask Nuno to design an icon for the grouping mode? So people can add a grouping mode button to dolphin. Looking great! A suggestion for the grouped view: having the individual groups shaded with a subtle vertical gradient, say, going from 0% to 20% grey, in the lower 30 pixels or so of each group, would help visually separate the individual groups better. The same could be done with a short, subtle horizontal gradient at the end of each group in the detail view. First I want to say: Thanks a lot for doing such a great work. Dolphin really is my favourite file browser. But there's one thing I can't get used to in Dolphin. It's the left side bar. I think something like in Elementary's version of Nautilus or in OS X's Finder would be way better to do file navigation! It just has cleaner look and more accessibility from my point of view. Are there any plans to support some viewmode and look like it? > time, instead of winning them? I'm not sure what you mean by this. Since Dolphin 1.0 only features have been added and nothing has been removed. The only exception now is the column-view. The column-view never has been available in Konqueror 3.5 so it is unclear for me what you mean with "loses features over time". If you mean KDE in general you please have to be more specific what features got lost over time (but this is out of the scope of this blog anyhow). > use it, but certainly you had much more views than you have now). You imply the "number of views" with "features"? I'd kindly ask that you install Konqueror 3.5 parallel to Dolphin 2.0 (or Dolphin 1.7) and really try to compare the capabilities of the views ;-) Regarding "With Konqeror 3.5 you could have all or almost all features that people ask" I'd recommend to check bugs.kde.org and you'll notice that this is simply not true. > much more difficult than with Qt 3? http://ppenz.blogspot.com/2011/08/introducing-dolphin-20.html gives some information about this. > Can you ask Nuno to design an icon for the grouping mode? > or in OS X's Finder would be way better to do file navigation! > [...] Are there any plans to support some viewmode and look like it? > each group in the detail view. Thanks for the suggestion. I already tried to do some improvements with gradients, but I could not achieve a result that really looks good :-( Some mockups from our Oxygen-artists hopefully will help. Last time I've tried 4.8 snapshot, dolphin didn't support inline renaming, was this dropped? > renaming, was this dropped? It has not been dropped, but I could not integrate it in time into the view-engine for Dolphin 2.0. So it has been temporary disabled and inline-renaming will be back again in 2.1 (see http://community.kde.org/Dolphin/Dolphin-2.0-Status for details). The grid spacing is done automatically now in Dolphin depending on the available space (it is kept as minimal as possible). If it was too spacious you need to decrease the text width. In general with Dolphin 2.0 more items fit into the same space than before. the new features are great! even the plans for dolphin 2.1 are very interesting and making a lot of fun to work with KDE/Linux in 4.8.x! Does the new view-engine also support shading the sorted column ? This feature never got implemented in KDE4 yet. Peter, awesome work as usual. Also congrats on gaining a new, active team member. @Suy: the answer is simple. To add new features, core stuff had to be re-written. Nobody has bothered to re-add some of the old features (while the new ones have been done by now). It's just a matter of interest: if (almost) nobody cares about those old features, well, nobody writes them, thus they won't be there. Meanwhile new ones are introduced. There has also been a bit of a change in the culture in KDE, with more emphasis on stability and usability and less on features. And it feels fast (just gave it a test run on some big folders). I did notice 1 "tiny" thing. If you have very long filenames it's all just shown.. It's not truncated to 2 lines maximal. I hope you can put that in for 2.0. > have huge text size & large spacing so it would be doable. > Will the new smartness be smart enough for that kind of stuff? I hope so ;-) The "huge text size" parameter is still there. In my opinion the automatic spacing is now smart enough to make it unnecessary having an explicit option - please let me know if it does not work well enough on your 10 m television screen ;-) From the feedback I got until now must people had problems with Dolphin's rather large spacing in the icons-mode. Now as the text-area and icon-area have separate hover-areas the spacing could be optimized. Still if you have e.g. 500 pixels available and 4 columns having a width of 101 pixels then the remaining width of 96 pixels will be shared as "spacing" between the rows. > you can put that in for 2.0. That's interesting: Showing long filenames and dynamically adjust the row-height was an often requested feature and the "truncation"-setting was not very popular. So this was intended as feature ;-) However there is a wish at https://bugs.kde.org/show_bug.cgi?id=288596 that requests to optionally limit the number of maximum lines - probably you can subscribe/vote for this. But this is definitely something that must be done after 2.0 as it is not allowed to add new strings shortly before the release. @Peter Penz. I certainly do vote for that! I often have filenames with varying lengths some very long and i just can't imagine someone even liking that.. If you look at the screenshot: https://bugs.kde.org/show_bug.cgi?id=288596 that looks just horrible! Peter, sorry, you are right, I wasn't specific enough. I was thinking of the following features. In the 3.5 times, you could have a minimal Gwenview embedded on Konqueror, plus, you could have the list of pictures sorted by the Exif time (this is the feature that you mentioned now). With the old kfile plugins, you could display lots of useful information and sort files according to it. I don't know if the Nepomuk/Strigi combination can provide the same as of right now, but if they can, it doesn't work out of the box for me. Another feature is the horizontal splitting. Konqueror still has it, but Dolphin lacks it. In a setup with several columns for different metadata, an horizontal split is a must if you need to work with two views. Maybe is that my memory serves me badly (very likely :-D), but I feel sometimes that the KDE 4 port was so huge, that many applications had to do a significant step backwards and still are recovering. @suy: I fear you have the wrong assumption that Dolphin should replace Konqueror, but this never was the goal. 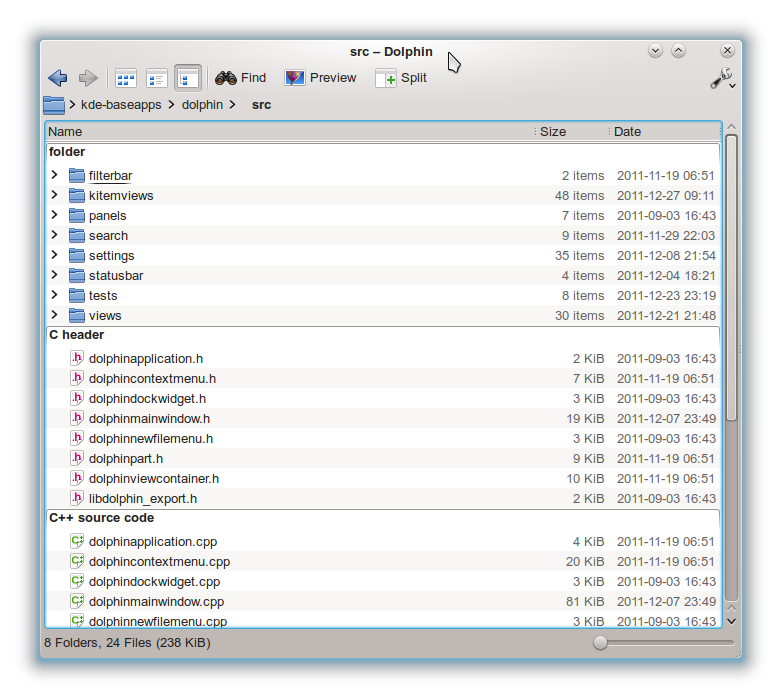 Dolphin is a filemanager-only application focusing on different target users with different needs and different features. And thats why we still have Konqueror in parallel: Still in Konqueror from KDE apps 4 it is possible to embed Gwenview and other plugins, it is also still possible to do unlimited horizontal and vertical splitting. Dolphin never will support KPart plugins and unlimited splitting on purpose. We think about optionally providing a horizontal splitting but as like now only 2 views will be supported. For people who regulary require e.g. a combined horizontal/vertical split to see 4 views in parallel Konqueror is the right application and not Dolphin. Regarding the Exif-information you are partly right: It cannot be shown yet as part of the view. On the other hand Dolphin/Konqueror from KDE apps 4 are capable of showing Exif information in the information panel and tooltips that Konqueror from KDE 3.5 could not show at all. This gap will be closed with the next version and of course there still exist features from KDE 3.5 that have not been reimplemented: Some of them on purpose, some of them because they are rarely requested and have a low priority (e.g. case sensitive sorting comes to my mind). I have just installed Kubuntu 12.04 - and the Dolphin is really fast. Thank you for your work! Will Dolphin ever support brief view - just filenames with small icon on the left? Ah i see - it's the compact mode - thank you! No! Not the column view! When I first used dolphin it was the MAIN reason for me to switch to KDE, and now you are removing it? Ok, I can understand your argument "the column view has obviously been used by only very few people but was tricky and timeconsuming to maintain" - but I think it can be reduced to the part of time consumption, because I don't think people will use the new grouping feature mutch. Just like the split view, svn integration, or other stuff like that. What is the problem with using the old codebase? It was already working near perfect in previous versions (until you added things like auto-width and -scrolling). What about scrolling by columns, not by pixels? I think implementing scrolling by columns should be easy for 'compact mode' because you already should know how wide a column is. But please! make it optional. When something similar (similar means: one scroll wheel 'click' moved the view to the next 'page' down, just like 'page up'/'page down' does in any document) was introduced to column view I was really annoyed not to find an option to turn it off. To me this behaviour does not make sense when scrolling vertical, but does when scrolling horizontal. First off thanks Peter! Dolphin is probably my favorite ever file manager. One thing i've noticed though is that the animations don't seem to be respecting the animation speed setting under desktop effects. Would it be possible to make Dolphin use that setting? or would it cause problems if you had the animation speed turned right down but then resized the window really fast? > setting under desktop effects. > Dolphin use that setting? It would be possible technically but I'd like to take the not so comfortable path to determine an animation speed that is not cumbersome and supportive for the eyes, so that it is not necessary to configure this at all. I had similar requests around Dolphin 4.1 when tooltips had been introduced. People asked for a configuration to specify the popup-delay. However after getting some feedback it turned out that tweaking the default value was all that is needed. On smartphones there is also no configuration option for the animation speed and nobody cares. Of course smartphones have the big advantage that the graphics drivers are a lot better and 60 frames per second are possible. Sadly on the Linux-desktop the situation is more tricky but in this case the option to turn off animations completely is available. great work, can't wait for kde 4.8! "Icon-Preview" -> File Size, Date, ..." -> "Voting or other tags"
Yes, that would be possible. There is also a bug report for this (see https://bugs.kde.org/show_bug.cgi?id=174455 ) However it has not a high priority because it is requested quite rarely and the efforts to implement this are higher than someone might expect: The current "one-line" layout of the metadata must be changed to a kind of grid-layout. Quite interesting: AFAIK the only file manager that uses the horizontal layout for the meta-information is the Explorer from Windows 7. But now in Windows 8 they have changed it to a vertical layout. But generally I like the idea to let the user decide what fits best for him. yes, i thought the same. i also noticed win8 changed the layout similar to dolphin. i don't use win7 but a bottom information panel could be a little bit more useful than the current one in dolphin. there is only a thin bar for number of folders, icon/preview size slider and a free diskspace field. maybe a bottom information panel could combine the thin bar with basic information panel supporting basic grid layout. Anyway, showing all meta data of (i.e.) jpegs is impossible anyway - even on a vertical sidebar on the right. but you know of this or not? Thanks, group mode really looks great. It would be helpful if there was a shortcut key to cycle through the groups. Anyone knows how to do that? First of all, yes, thank you for the great work ! This is also one of the features I very much like in MacOSX's Finder. I very much hope somebody will find time to re-implement this ! Good job on everything else, though. I just can't get over this loss. Arch hust updated KDE to 4.8 and what the @£½!» – Dolphin has no more column view! Okay, that does it... I’ve been struggling hard to stay in KDE despite all the bugs that kept accumulating version after version without getting fixed, but this is the last straw. It was the ONLY functional mode of Dolphin and the main reason I was still happy with KDE. First thanks a lot for your work. 1 question: After updating KDE to 4.8 on openSuSE 11.4 I can't find the option for direct file renaming in dolphin's configuration. Is it gone away? Hi I’m using opensuse 12.1 and dolphin 2.0, but I’ll like to use columns mode (this is one of the biggest reasons that I like LINUX ), there is an application for do it ??? if it’s not !! !, how can I get back to previews version of dolphin in KDE 4.8 that include columns mode ????? Just wanted to say : thank you Peter ! I use Dolphin 2.0 since the release of KDE 4.8.0 and encountered no problem and no crash at all despite the tons of improvements ! Awesome sauce! Thank you for this amazing code. I'll be rooting for arbitrary grouping category. I'm a fan of Nepomuk. This grouping feature will drive more Nepomuk utilization on user side. People will have the much-expected incentive to add more metadata to their data. (Other) Application will start adding contextual metadata to their produced files, eg: project name in KDevelop, etc. And finally we'll have our semantic desktop year. Will be looking forward to tis grouping feature. I hope Nuno will come up with a mockup soon. Yay! I was about to hack dolphin to add arbitrary nepomuk based grouping -- with my zero Qt/C++ knowledge. Unfortunately you guys have beaten me already :D. Go Nepomuk go! There are still two showstoppers - at least for me: 1. filenames are not truncated and 2. rows and columns autoadjust to longest filename. I want to have the rows and columns in fixed width and height and I really don't want to see the whole filename (it can be shown in the tooltip or sidebar or status bar) because that just looks messy and deceases (my) workflow. just echoing the sadness about the loss of column-view. i've been using unity for a while and i thought of a cool kde setup to use because i missed column view and dolphin in general... i setup new kde 4.8.2, got everythign perfect, and blam i'm looking all over the settign for column view.... i'm going to make a little column-view shrine and cry tonight. In Dolphin 1.7/ KDE 4.7.4, the Size column in detailed view automatically switched between B, KiB, MiB, GiB depending on file size. In Dolphin 2.0/ KDE 4.8.1, there is always only KiB used in the column view. (Status bar and properties window still switch between B, KiB, MiB, GiB according to order of magnitude of file size.) What happened to the detailed view column; will it regain the former size-sensitive display? This was reported in https://bugs.kde.org/show_bug.cgi?id=289850 andfixed in 4.8.3. Fine, perhaps next time I will update my system to GNOME. I also want to say that I really loved column mode, and I hope that it comes back soon. If I had more time, I would learn QT development just to do this. I would be happy to put money behind it instead. Without column view mode, KDE lost its identity. How can you said it's KDE? when the view mode is no different from Gnome2 or nautilus? Mouse selection is better than before. Dolphin 2.0 is much better in terms of speed. thanks for making my life more difficult. thanks for converting a stable file manager into a joke that cannot copy file reliably.